I got these functions going again today. They’ve always been in there but I had them turned off while converting the more important code features. 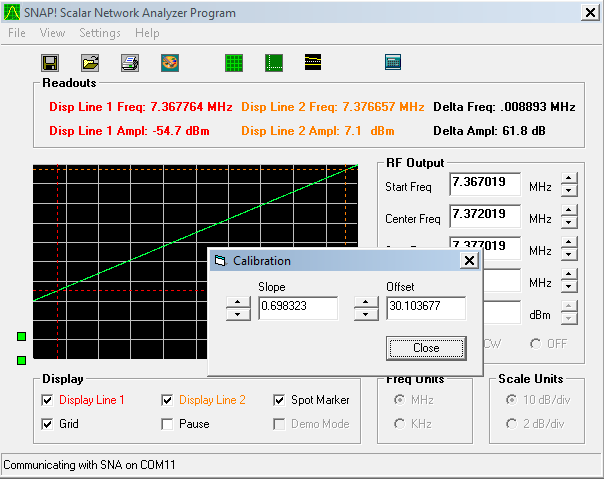 Basically, “Calibrate” is a menu item that let’s you specify a trace slope and trace offset so you can calibrate the screen display to your particular log detector. The “Print Preview” feature copies the trace display into a print window with all the instrument setup parameters listed below, as well as an area where the user can type comments. When you press the “Print” button, the display goes out to the default system printer. There’s also a “Save Picture” button that saves the trace display window as a color .bmp file. I’m almost ready to release alpha test versions of the software and firmware to the download site. Only thing holding this up is a hardware issue where RF is either radiating or conducting from the DDS module’s clock into the log detector, preventing it from going down below about -40 dBm. Today I got around to marrying the SNAP! firmware & software systems to my breadboard hardware system – it lives! There still some work to be done on the hardware getting the zero-signal baseline voltage down where it belongs and on the SNAP! software system to get the log display scaled properly, but we do have functionality. Here’s a screen capture of a 6-pole crystal filter I made about 25 years ago. Display-line markers are turned off for now. You probably can’t tell by looking at it, but the log range is a bit exaggerated and the filter is actually much flatter than it appears. I’ll be working on this. 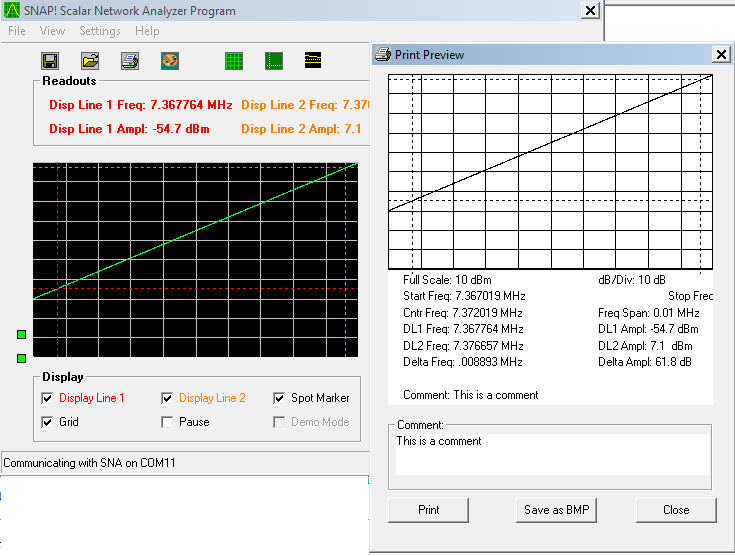 I now have the SNA firmware and software to a point where I’m almost ready to do an Alpha test release after I confirm that it still works with the hardware. This new software system will be called “SNAP!”, for Scalar Network Analysis Program”. SNAP! software is feature-rich and includes two on-screen X-Y display lines with digital readouts as well as an on-screen spot marker with readout. All screen colors are user definable and there’s a screen-print function that lets you print out your sweep with user-comments added. You can also save the on-screen display to a file and load it back in later. Coming in future releases will be a ‘normalize” feature that corrects for non-flatness in the hardware’s amplitude response as well as a calibrate function that allows you to exactly match the display to the log detector’s slope & offset. All of this functionality is already in there from 2003, but it will take some time to adapt it to the major changes I made to get it working with the new hardware. The Arduino firmware will also be released as a .hex file and the protocol is already on the web site for developers who wish to adapt their own hardware to the SNAP! software system. Once I get the initial releases of the software & firmware out, anyone who wants to breadboard the very simple hardware can have a go at it. Then I plan to begin development of a PCB that fits inside an Altoids tin. I spent a good deal of time over the weekend working on this. As I got further into it, I realized there was room for much improvement. Due to PIC & PC speed limitations when I developed this system back in 2003, the plotting resolution was 100 x 100, which implies a vertical resolution of only 0.8dB (assuming a full-scale full-scale range is 80 dB). With the faster USB communications (115Kb vs 9.6Kb), I was able to increase both the horizontal and vertical resolution so that it’s now a 1024 x 1024 format. 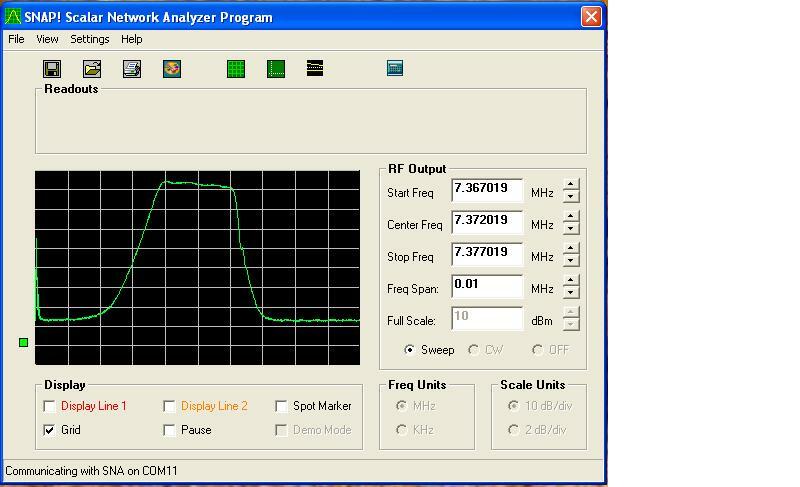 This improves the vertical resolution to about 0.08dB and the horizontal resolution is now in the Hz range when doing a narrow-band sweep on something like a crystal filter. It appears that, with this resolution, I can still get about 4 screen sweeps per second, which is plenty fast. I also got the 2 display lines working with this improved resolution. I’m working on the spot marker now. Once I get all this working, I want to build a larger plot window. The present window was sized for the 640×480 PC screens that were still common in 2013. While writing about crystals and how to characterize & use them in filters, I started to think about a very nice little Scalar Network Analyzer (“Sweep Set”) I developed about 2003 and how it could be used to characterize crystals as well as evaluate filters in a recurring sweep mode ; ie, real time screen updates while tuning the filter. I decided to digress a bit and take some time to re-design the unit with more modern, readily available and cheaper components. You can see and follow my progress on that project here.